We are working with the local community, key stakeholders and our project partners to redesign Tarralla Creek. Thank you to everyone who viewed our concept designs and contributed feedback online and in person at our pop-ups. We are leaving the concept designs online so you can continue to view and share them. In the meantime, we have started reviewing all of the great and constructive feedback and we will share a summary of your ideas and suggestions closer to the end of this year. Stay tuned! Once we've summarised all of the feedback, it will be used to further refine our designs, which will be completed in early 2019. Make sure you follow this page to keep informed of future updates and announcements. We're committed to enhancing life and liveability by working with the community and project partners to transform a two kilometre section of Tarralla Creek into a fun and friendly open space and waterway. The section to be reimagined extends from Dorset Road to Eastfield Road, Croydon. We will enhance the area by adopting contemporary urban design and landscaping ideas and incorporating suggestions from the community. Reimagining Tarralla Creek is the third project launched this year and is part of our Reimagining Your Creeks program. Take a look at the concept designs we developed with your input. View community ideas and learn more about past and future activities. Take a look at the interactive map, drone video and 360 degree view of the project area. Read the latest project news and keep up to date with events and opportunities to have your say! 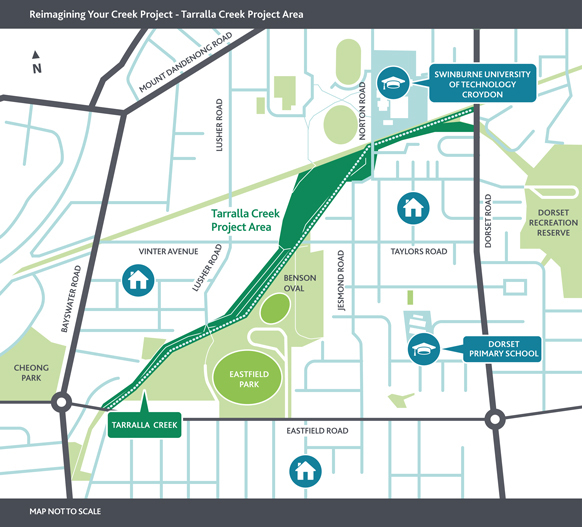 We want to understand your vision and ideas for how we could transform this section of Tarralla Creek. You can share your ideas by using the tools on this page or come and talk to us at a community information session. The Tarralla Creek Community Advisory Group will provide local knowledge, ideas, suggestions and feedback for the creek's redesign. The first workshop was held in September and our second workshop was held on 17 October 2018. We will use your feedback to shape the intial design and share this with you to ensure we have got it right. We will share the concept designs online and with the community advisory group for feedback. We will be undertaking design development, modelling and statutory approvals. The Project Partners are working on funding opportunities and this will determine the construction start date. Depending on the total cost, some aspects of construction may be staged.